The PowerGrip H20 is the most progressive GoPro accessory to date. Our team spent over a year researching, designing, filming, and taking user feedback to create one of the most powerful GoPro pole systems to date. We wanted a single accessory that kept our cameras powered all day, captured multiple perspectives, and gave us the freedom to bring only one item with us. We packed all the features our team and our customers asked for-from extreme sports to everyday moments, the PowerGrip H2O makes it easier than ever to document your life. Rechargeable 6700 mAh Battery: Packed into the PowerGrip H2O is the most dense battery available, allowing you to film with your GoPro for 12 straight hours. This battery is large enough to charge your GoPro 6 times, or your iPhone 6 three times. 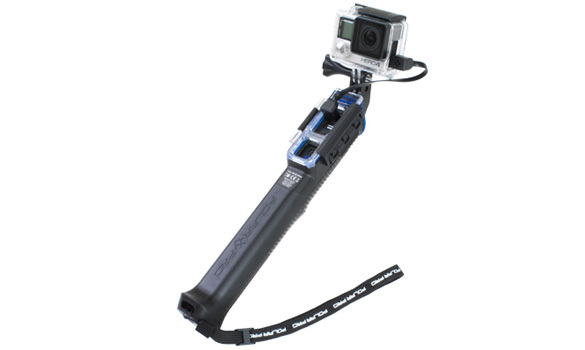 4-in-1 GoPro Pole System: Can be configured as a: 9.5-inch grip, 22-inch pole, 33-inch pole, or a great follow-cam setup. 1/4 20 Tripod Mount: A mount is included at the base of the grip for turning any tripod into an extended power source. Mount the PowerGrip to any tripod for extended time lapses. 2x USB Ports: Two full-size USB ports provide enough power to simultaneously charge cameras, phones, speakers, headphones, and even lights. The PowerGrip H2O can be used as a very convenient waterproof power-bank. Cell Phone Mount: A cell mount is included allowing mobile phone users to harness all of the features of the PowerGrip so you never run out of power while shooting. Compatible with phones up to an iPhone 6.